Renee Arakaki (b.1957) is a sansei Okinawan-American born in California and raised in Hawaiʻi. 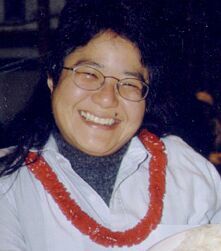 She received her DM from Northwestern University (2002), where she studied with M. William Karlins and Michael Pisaro, and her MM (1997) from the University of Hawaiʻi at Mānoa. Her experience of growing up with grandparents, with daily exposure to Okinawan folk music and Buddhist ritual, informs Renee's use of melody and rhythm; decades of singing and performing in rock bands is reflected in her focus on the visceral power of musical story. Renee's music for concert and dance have been performed in Honolulu, San Francisco, Chicago, New York City, Oslo, London and Prague. She is currently a member of the Creative Media faculty at the University of Hawaiʻi-Windward Community College in Kaneohe, HI.